The Armenian cultural environment is impossible to imagine without the khachkar: the khachkar acts as an indicator of the location of spiritual complexes, an organizer and a culturing agent of their surrounding natural environment, accompanying the believer and pilgrims to holy places. The roads and surroundings of holy places are dotted with small chattels, khachkars, holy letters and springs. 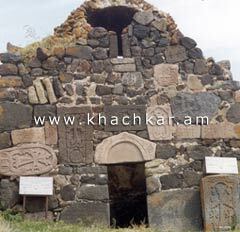 The Armenian church had been following the rule referred to St. Nerses which prohibited burials in a Christian temple. And although starting from 10th century certain temples allowed noble houses to have their own closed graveyards that were attached to the western part of the churches, the tradition of burials and the erecting of khachkars near churches was practiced until the late middle ages. They not only enriched the view of the structure but underlined the special attitude of medieval Armenian society toward the deceased, when society was perceived as a common society of alives and the deceased. The khachkar was presented also as a detail of three-dimension solution or framework of church structures and other spiritual complexes; being used as building material, or a part of the artistic decoration of a temple or church. Often khachkars and carved pieces from surrounding areas were collected and formed open air galleries near the walls of spiritual structures. The khachkar with its three-dimensionality and carving solution displays architectural-practical feature that are characteristic of a Christian temple. The outline of the khachkar composition on the one hand presents external rectangularity, and internally, the cross harkens to the plan of temple and the rectilinear profile of dome temple. Thirdly it is similar to the temple�s decorated, alter etc. An examination shows that the khachkar matched the dual measure of the church in its composition (west-east and top-bottom), by this uniting ritual and ideological (which in church structure remains to a certain extend divided), which made the spiritual communication with the khachkar more for the believer. The biggest collections of khachkars originate from churches and cemeteries, which served as a basis to consider a khachkar as a gravestone. Researchers of khachkars are inclined to move away from this "unfortunate portrayal". But a connection between the khachkar and a burial, in cases when it is erected on a tomb leaves hardly any doubt. A khachkar can be erected on any occasion that was not regarded as contradictory to Christian world perceptions and morality of the time, thus death in the middle ages was a main motive for erecting a khachkar. The khachkar is in Armenian medieval cemetery structure realized the function of the rectilinear component. It is typical that in the middle ages it was almost impossible that a cross composition be carved on a plain gravestone. Before the appearance of khachkar the upper portion of a grave structure, as a rule, was either in the form of the upper part of the rectangular parallelepiped with two sloping surfaces upper (the model of ark or church basilica structure) or just a plain horizontally placed slab. 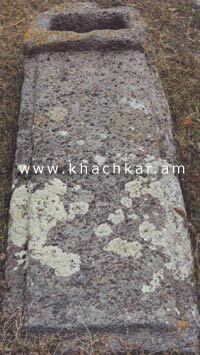 With the appearance and individualization of the khachkar grave structures acquired duality: a plain (or rectangular parallelepiped) gravestone that was placed horizontally and a rectilinear erected khachkar. Thus the cross as a common negotiator absolutely assumed a rectilinear position (as also the khachkar had), and with this the khachkar was basically distinguished from any gravestone. According to several Christian and Armenian traditional perceptions, on the Last day the deeds of humanity will be presented by the help of the book of life, which is compiled by angels. 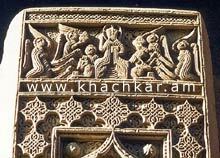 The top of the khachkar- the composition of Christ as a Pantocrator on a Throne with images of saints and sometimes begging mortals presents this trial. The book of life can be filled by the believer or by his relatives - by inscribing the good deeds, name and the image. Such a role was delivered to hand written colophans, temples, decors and ceramics presented to religious centers, generally - to any surface, object of holy structure on which the writing of the name and/or image can be left. In this list the role of the khachkar is very crucial, which as a rule, was an individual stele and gave an opportunity to present the "deed" of a separate individual. In fact, the khachkar with its plain-rectangular form (which recalls a book or a page of a book), with its inscription (which is very similar to a text in a book), with the depiction of mortals and, by its monumentality, which is also important, appeared as a "book of life", which will represent the believer to the Last Judgment.